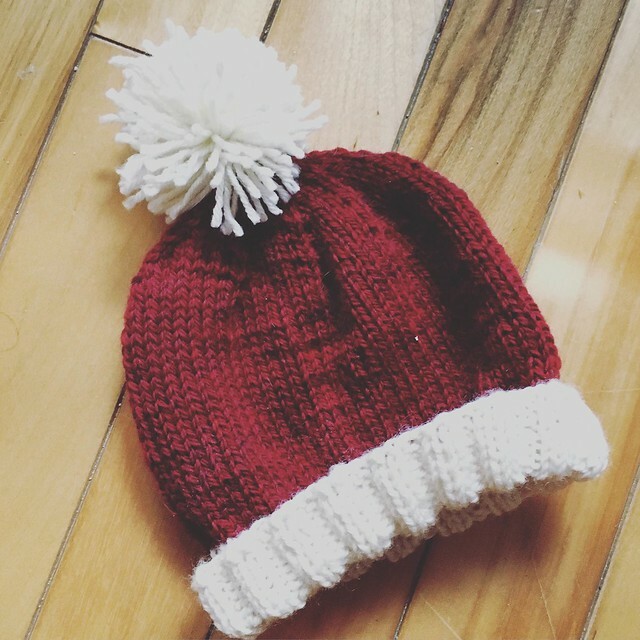 You still have time to knit a little gift for someone you love! yarn: any worsted weight yarn, such as Cascade 220, W4 Shelridge, Shepherds, etc. In red and white – or whatever colors you like. Needles: 3,5mm and 4mm (circular 40cm/16″ long) and 4mm (dpns). Note: use whatever size you need to get the gauge. Notions: 1 marker; darning needle. With smaller needle and color A, cast on 64 (72, 80, 88, 96) sts. Work in k2-p2 ribbing for 6 (6, 8, 8, 8) cm. Change to color B and larger needles, and knit for 6 (7, 7, 8, 10)cm / 9 (10, 11, 12, 14) cm measured with ribbing folded. note: start accordingly to your size and keep working decreases to the next size until you have only 8 sts total on your needles. Keep working the following decreases. rounds 4, 6, 8, 10 and 12 : knit. Cut the yarn and place the end on a tapestry needle. Pull the needle through the remaining sts and pull up tight to close the hole. Pull the end to the inside and weave in ends.Você ainda tem tempo para tricotar um gorrinho para alguém que você ama! fio: qualquer fio classificado como worsted, quer dizer, novelos ou meadas de 100g = 200m. Eu fiz em vermelho e branco, mas você escolhe as cores que mais gostar :). agulhas: 3,5mm e 4mm (circular 40cm) e 4mm (duas pontas). Obs: use qualquer agulha que te dê a amostra informada abaixo. acessórios: 1 marcador; agulha para acabamento. Com as agulhas mais finas e a cor A, monte 64 (72, 80, 88, 96) pts. Trabalhe em barra 2×2 por 6 (6, 8, 8, 8) cm. Mude para a cor B e agulhas mais grossas. Tricote em meia por 6 (7, 7, 8, 10)cm / 9 (10, 11, 12, 14) cm de altura, medidos com a barra dobrada. Obs: comece de acordo com o tamanho que você escolheu e siga fazendo as diminuições descritas para o tamanho seguinte até que você tenha apenas 8 pontos nas agulhas. Continue diminuindo de acordo com o tamanho a seguir. carrs 4, 6, 8, 10 e 12 : meia. Corte o fio e coloque-o na agulha de tapeçaria. Passe a agulha por dentro dos pontos e puxe para fechar o buraco. Coloque a agulha para dentro e arremate.